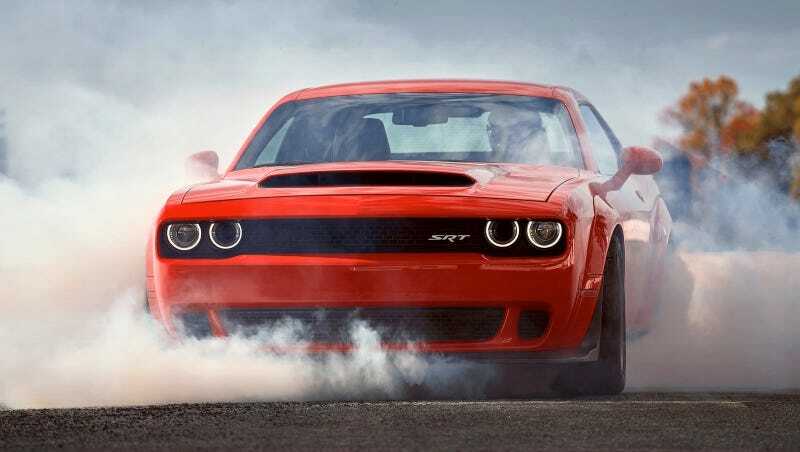 It has come to the attention of this august body, the Jalopnik Editorial Board—the second-most respected editorial board of any publication in the world—that the Fiat Chrysler company is releasing an 840 horsepower version of the Dodge Challenger. After careful evaluation, this editorial board has decided this is bad. The Dodge Challenger SRT Demon is bad. Car bad. We have but one question to ask: did anyone at Fiat Chrysler consider what would happen if ISIS got its hands on the Dodge Demon? That would mean ISIS’ insurgents would waste no time in stealing all of America’s pink slips. For the sake of America’s pinks, we condemn the Fiat Chrysler company in the strongest possible terms, call upon President Trump to seal all of these unholy Canadian monstrosities in a cement tomb to be sunk in the Pacific Ocean, and implore everyone to buy old Toyota Celicas instead.